One curious fruit you may have seen popping up lately at your local produce store is the Australian Persimmon. Available from late February to mid-June, this autumnal fruit looks sort of like an orange tomato – but I can assure you it tastes nothing like its doppelganger. 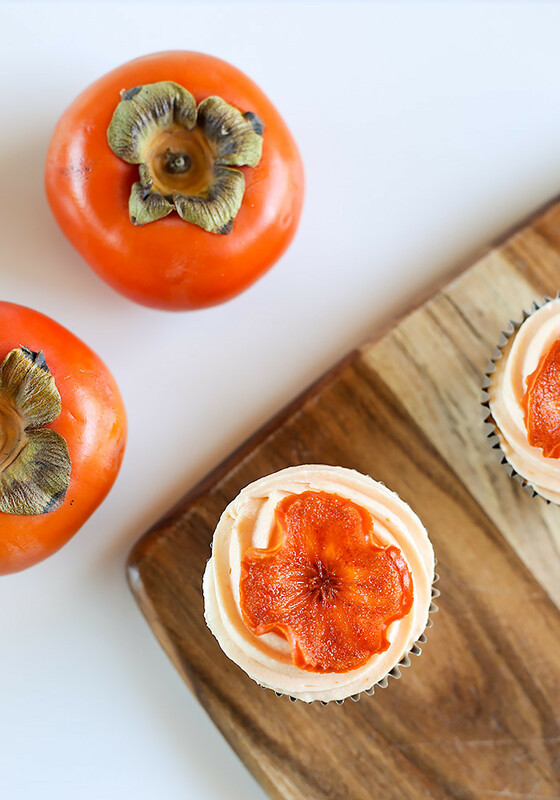 Persimmons are commonly eaten in China, Korea, Japan and Vietnam, and are slowly becoming more popular in Australia thanks to their nutritional benefits and delicious taste. 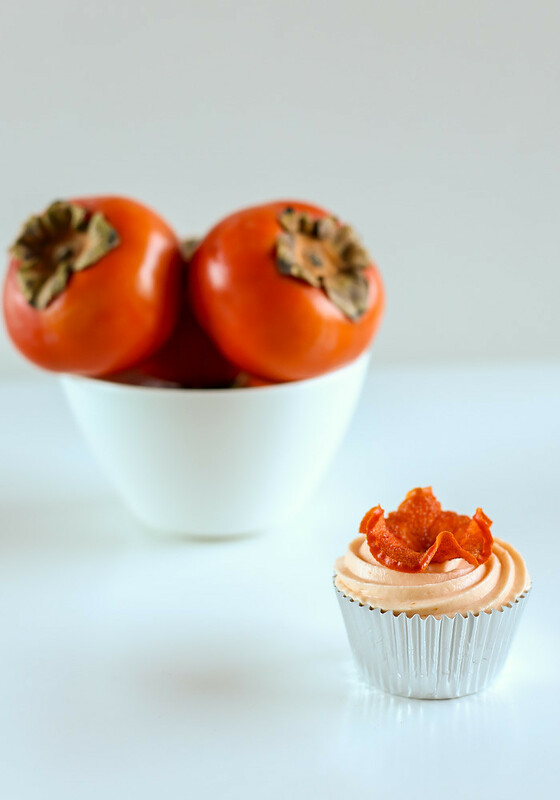 Persimmons could seriously be in the running as our new super food, as they are high in fibre, vitamin C, beta carotene and low in calories. 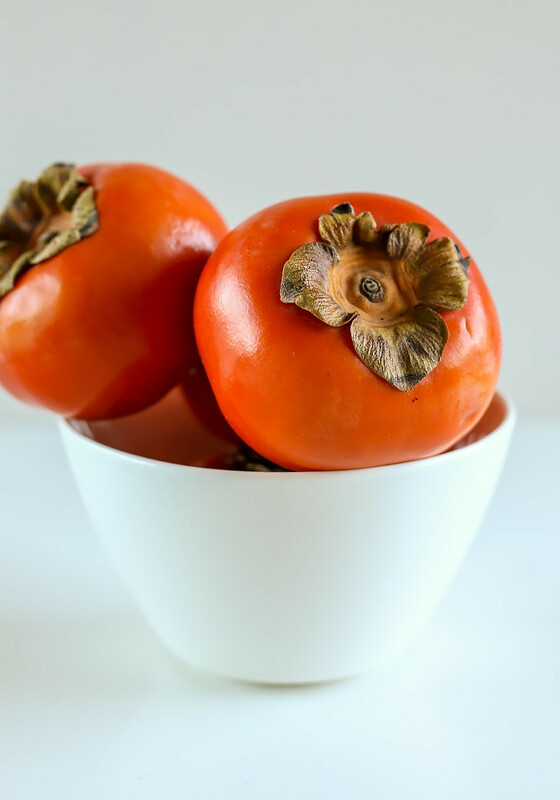 There are 2 types of persimmons – the Fuyu and the Hachia. Fuyus are what I used in this recipe and are a lighter orange colour and slightly squat in shape. They can be eaten raw when firm like an apple, or you can let them ripen further until mushy and soft. 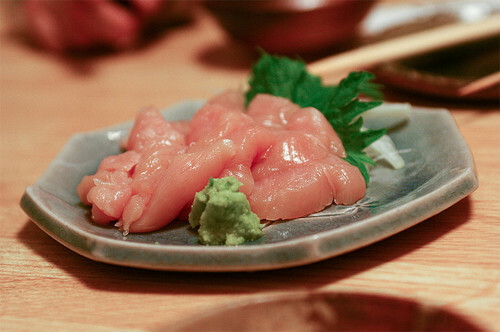 The Hachiya is darker in colour and heart shaped, with a stronger flavour than Fuyus. You need to wait for this type to ripen properly, otherwise the the flavour can be unpleasantly astringent. Preheat oven to 180°C. Line 12 muffin tins with cupcake papers. Cream the butter and sugar with an electric mixer until light and fluffy in a large bowl. Beat in eggs, persimmon pulp and milk until thoroughly mixed through. Sift flour with spices and add to wet mixture. Mix until just combined (over mixing can result in tougher cupcakes). 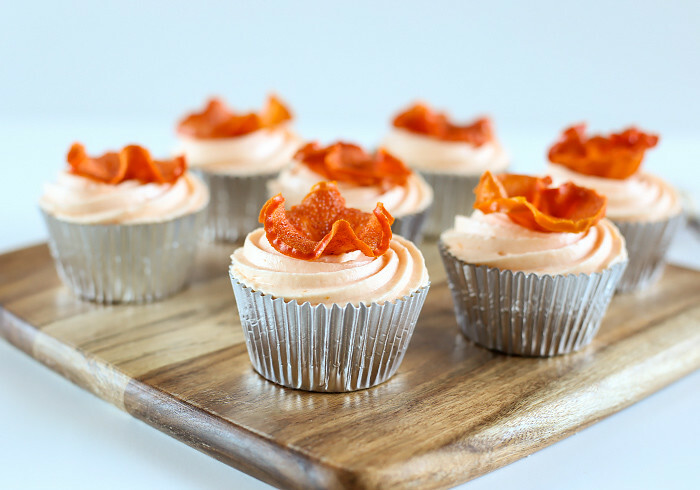 Fill cupcake wrappers ¾ full and bake in the oven for around 25-30 mins or until golden brown. Add in persimmon pulp. Continue mixing for 5 minutes until the icing is light and fluffy. Spoon icing into a piping bag and pipe swirls onto the cooled cupcakes. To make persimmon "flowers", turn over down to 110°C. Thinly slice 2 persimmons lengthways and arrange rounds on 2 lined baking trays. 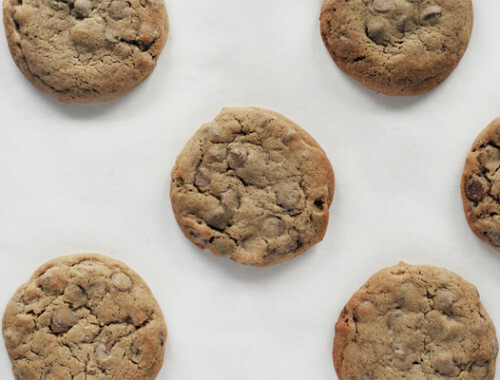 Bake for 30 mins, then turn and cook for another 30 mins. Transfer rounds to a mini muffin tin to cool, so they curl up and form the shape of a flower. Once the "flowers" are cool, top each cupcake with one. Persimmons are extremely versatile and at the Persimmons Australia dinner recently at COOH I got to sample them in a cocktail, salad, with roast meat and as part of a dessert. 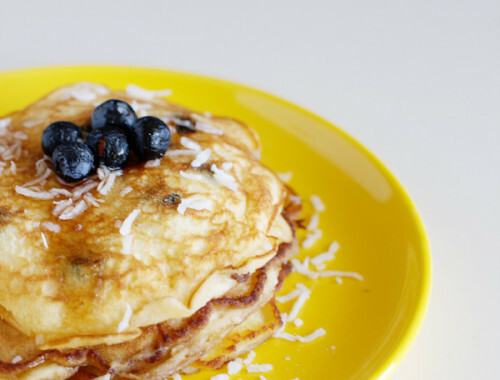 It probably comes as no surprise that I wanted to give these fruits a spin of my own, and this recipe was born after a bit of experimenting. So what did I come up with? 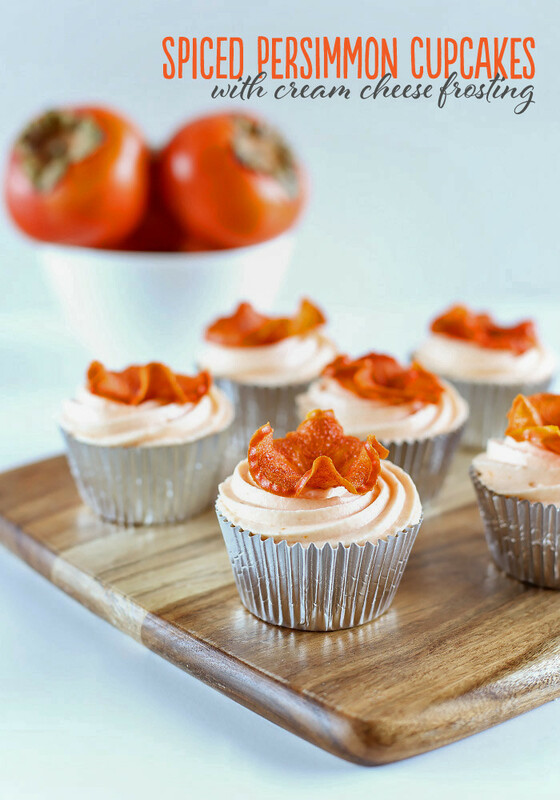 Well first we started with a persimmon cupcake flavoured with spices, topped with a persimmon cream cheese frosting that had the most gorgeous peachy colour, and last but not least, a dehydrated persimmon “flower” on top. This is quite a dense cupcake, as adding fruit pulp to the batter can make the finished product a little heavy. 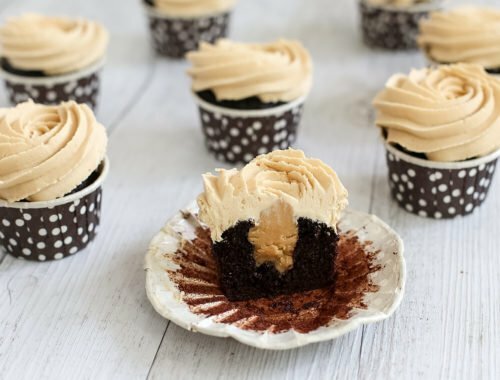 But the addition of spices and light and fluffy cream cheese frosting turned this cupcake experiment into a delicious treat almost in a similar vein to carrot cake. My favourite way to top fruity cupcakes is with a dehydrated element of the fruit. I first did this with pineapples in my Pineapple and Coconut Cupcake recipe and it was a simple, pretty and tasty way to show off the fruit. I sliced the persimmons as thinly as possible (a mandolin would have really helped) and then dried them out in a low oven for an hour. I let the persimmon flowers harden up in a mini cupcake tray which lets them curl up and look more flower-like. And the end result? 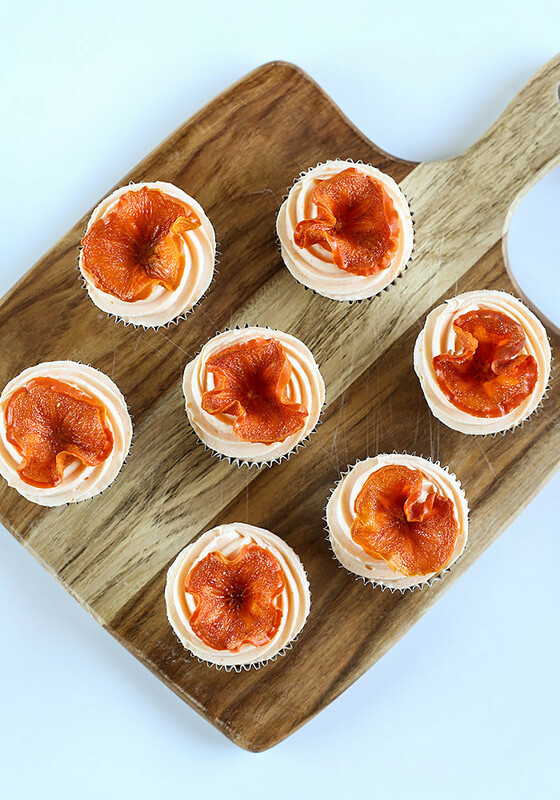 A moist, slightly dense cupcake topped with a swirl of persimmon-flavoured tart frosting and a sweet and crunchy persimmon flower on top. 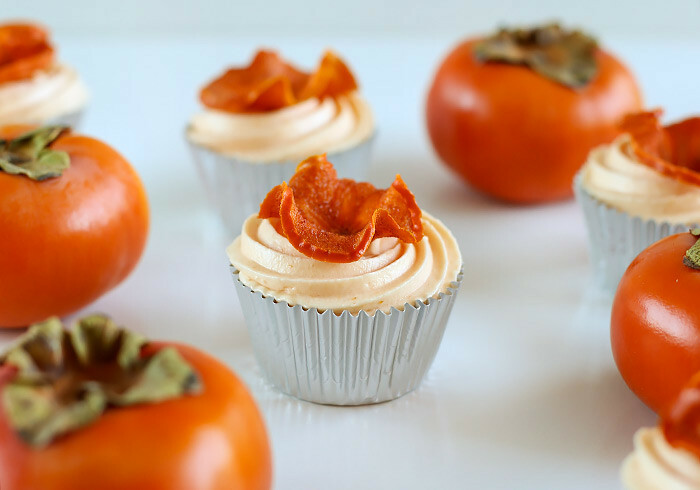 It’s a delicious way to enjoy persimmons and make the most of them this season! 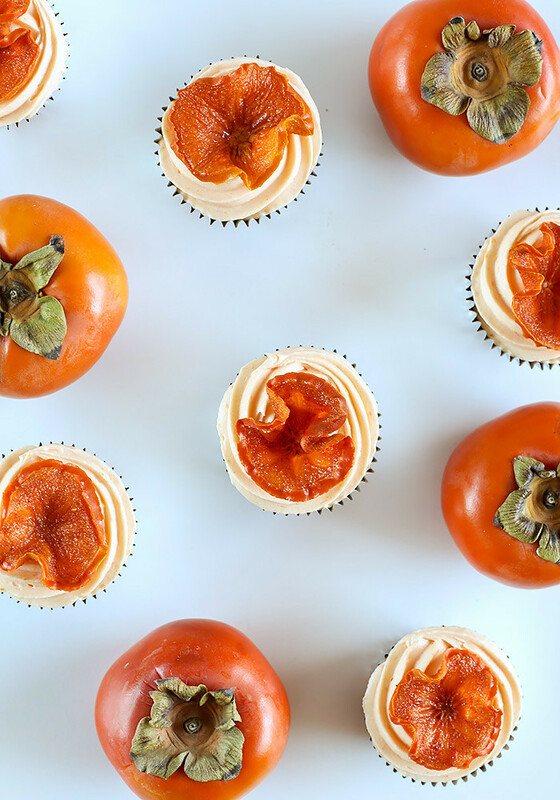 Have you tried a persimmon before? 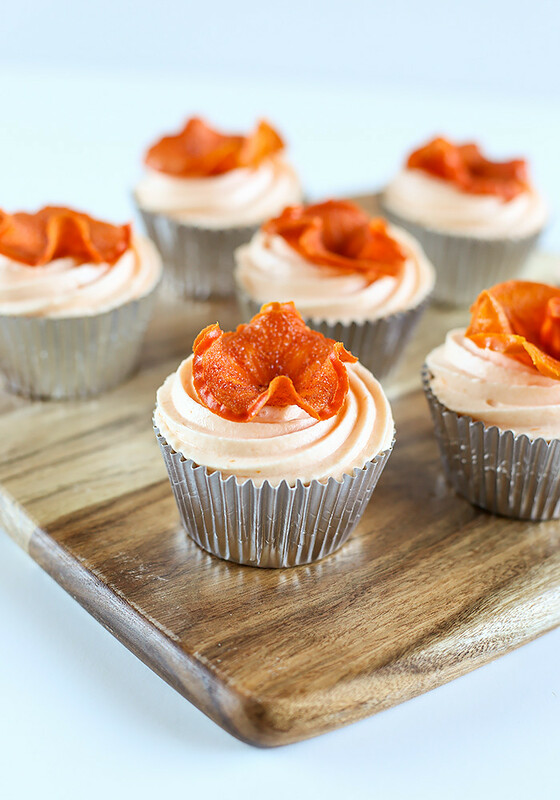 I can forsee myself making the dehydrated persimmon toppers as a snack instead! I love persimmon but I like it to be hard and crunchy as opposed sweet, soft & jelly-like. 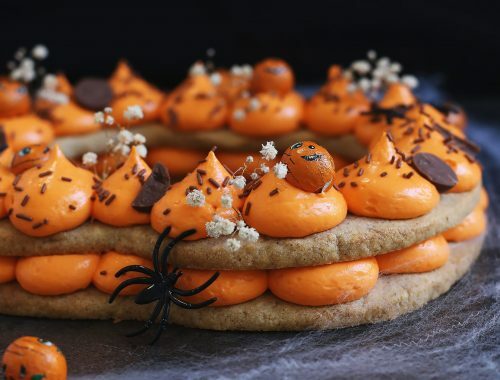 Such a lovely way to use persimmons! 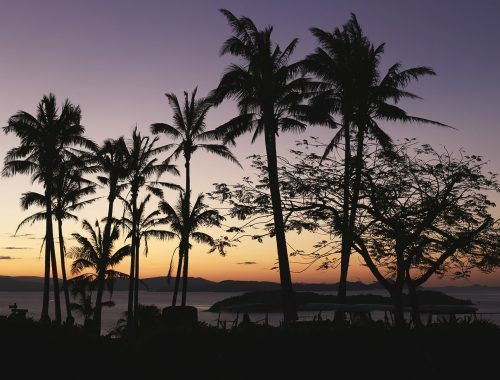 Your photos are absolutely stunning as always!!! 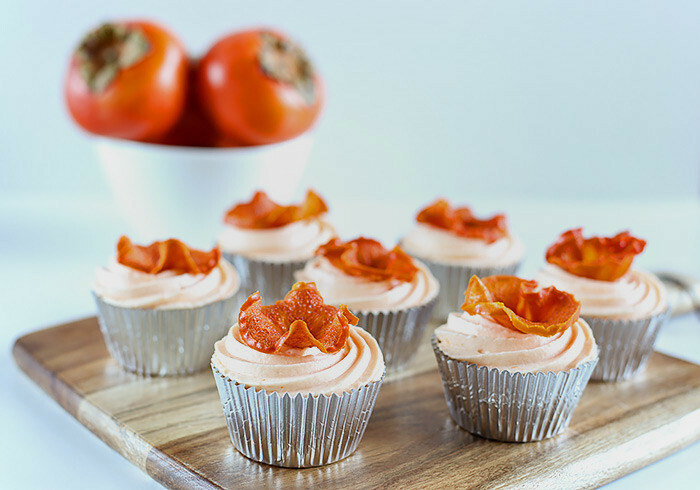 Persimmons are something that I never really cook with… after seeing these cupcakes though, that is definitely going to have to change! 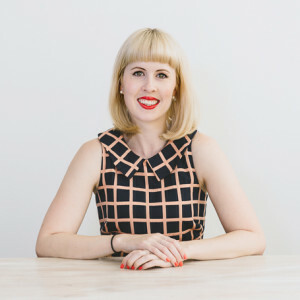 It’s so chilly in Sydney now, I guess my wishes were answered ;) Hope you enjoy the persimmons Lisa!